The largest square in the area has two remarkable buildings. The Loge du Change, on the west side, was partially built by the great architect Soufflot. 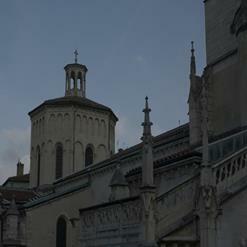 It is now a Protestant church known as Temple du Change. Opposite is the Maison Thomassin, with its Gothic-style 14th-century facade.